Donald Trump’s family separation: The government had no intention of reuniting parents and children. 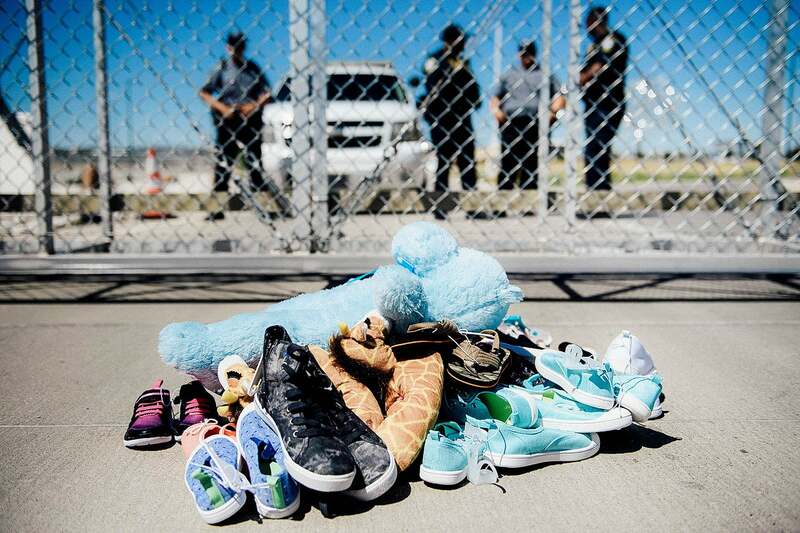 Security personnel stand before shoes and toys left at the Tornillo port of entry where minors crossing the border without proper papers have been housed after being separated from adults on Thursday in Tornillo, Texas. Once there was a policy that wasn’t really a policy. For some period of time, which may or may not be ongoing, the U.S. Justice Department was routinely treating parents who were caught having crossed into the U.S. without border inspection (a misdemeanor offense) as criminals to be briefly incarcerated pending a hearing and then placed in immigration detention. Additionally, Customs and Border Protection was often separating parents and kids who legally presented themselves at a border-inspection point, seeking asylum. Under the new policy, children in either case were removed and placed first in shelters and eventually in foster care or other centers. Some members of the Trump administration persistently denied that this was a policy. Others, including the president, bragged about it. Either way, last week, Donald Trump—who had insisted that only Congress could remedy family separation—signed an executive order pledging to detain parents and children together. As a result of this practice, at least 2,300 children were taken from their parents, without a hearing or due process of any kind. Many of those children were shipped hundreds of miles away. Some of them are in New York, for instance, where they were brought, some under cover of night, and where they are being housed in various facilities. They are heartbreakingly alone in institutions that haven’t been prepared to handle them. On Thursday night, reports surfaced that children had been treated for illness and depression—one child was reportedly suicidal—in city hospitals. At least one mother was reunited with her child on Friday, doubtless because she filed a federal lawsuit demanding reunification. But most lawyers seeking to help the children have reported that they have met with nothing but roadblocks. Jose Xavier Orochena, an immigration lawyer in New York who represents the mother of three children who were separated when they arrived seeking asylum from Guatemala, told WNYC that the three children—aged 10, 8, and 5—are not even in the New York immigration system. The immigration docket has them still residing in Arizona. For legal purposes, the children are being treated as though they crossed the border themselves, even though some of them are infants and toddlers. It pains me to write these words, but it certainly seems that the administration truly had no intention of reunifying these families. There is no comprehensive database, and the administration has clearly stated that reunification may not be in the cards. Even parents released on bond may try fruitlessly to find children who have been sent across the country. In New York, where the children are entitled to immigration hearings, lawyers are finding it hard to get them onto any docket. More and more they appear to be in some kind of procedural and legal limbo, with counselors and lawyers trying to craft systems to protect them as the policies shift on the ground. On Saturday night, DHS put out a fact sheet about reunification plans, but the toll-free numbers apparently still do not work, and many children have not yet spoken to a family member. On Monday, Vox reported that the government would only promise to attempt to reunite families who gave up their asylum requests and voluntarily agreed to be deported. What has become quite clear is that the Trump administration is not prioritizing reunification, or seemingly even terribly concerned about it. More terrifying is that it is clear that a rollout that was months in the making seemingly didn’t include provisions for properly identifying and coordinating which children were removed from their families and how to reconnect them. It pains me to write these words, but it certainly seems that the administration truly had no intention of reunifying these families. Whether there is, in light of additional separations, whether there are additional procedures [that] could be put in place to improve those procedures or expedite those procedures, I think is the subject of ongoing discussions. I don’t think that I can make any representation today that would be sufficient for the court to rely on. And when Sabraw pressed her on whether interagency communications were being improved to help track down families that had been split apart, Fabian also had no good answer: “I can’t say today there is a formalized process for that,” she said. Under this analysis, children are being removed because the Justice Department believes presumptively that everyone bringing a child across the border is a criminal—in this case having committed misdemeanor illegal entry—and criminals should—perhaps permanently—lose access to their children. Yes, it’s perfectly circular if you change the rules to treat all migrants like criminals, but that certainly does seem to be the point. The hardship of separation to a mother and her young daughter cannot be denied, but neither can the governmental and public interests in protecting children from exploitation by smugglers and human traffickers. Those interests would be irreparably harmed by interference with ICE/ERO’s discretion to transfer children to the care and custody of ORR over concerns about their safety and welfare and/or with ORR’s determination of placement with a suitable sponsor. What the government has been attempting to do here is to create a presumption that the parents are endangering their children and that kids need to be removed for further investigation, by the mere fact of their immigration status. Elsewhere in the DOJ brief, the government said it would only reunite one such lawfully asylum-seeking mother and daughter if it could make “a determination that the proposed custodian is capable of providing for the child’s physical and mental wellbeing.” The mother and daughter were eventually reunited, but only after the government claimed the right to not reunite them in court. The government is arguing that the very fact of the immigration detention to await a pending asylum claim somehow opens the possibility of a new determination of fitness. That is what charging every misdemeanor border crossing will do, and what treating every migrant like a criminal does. The DOJ briefs expressly compare pre–asylum detention to pretrial detainees in criminal courts, pointing out that the latter may lose parental rights. The difference, of course, is that pretrial detention in the American criminal justice system has an end date that doesn’t have the possibility of resulting in deportation of the parent without the child, as has reportedly happened during the Trump child-abduction experiment. Margo Schlanger, a law professor who ran the DHS Office for Civil Rights and Civil Liberties in the Obama administration, points out that thus far, the misdemeanor sentences have been very short—time served, usually—and there are small armies of volunteer lawyers helping parents get out of immigration detention on bond. So most of the parents will probably not languish in either criminal or immigration detention. But even when they get out, Schlanger said, “they are facing incredible bureaucratic obstacles to reunification, with systems that seem almost designed to be inaccessible to migrant parents, even with lawyer help.” And as the president tweets that there should be no due process whatsoever for migrants and orders that camps be built for tens of thousands of families, reunification does not appear to be his top priority. The federal government has designated a detention facility in Port Isabel, Texas, as a “reunification and removal center“—but so far, no reunifications seem to be occurring. And—as previously noted—the announced plan covers only parents who are being deported. What about those who have asylum claims to stay that they want adjudicated? They’ve demonstrated their “credible fear” of persecution, and now they are supposed to proceed in immigration court. Do they have to do that without their children? As the New York Times has reported, federal immigration courts faced a backlog of more than 700,000 cases in May, and cases can take months or years to be heard. And new reports are surfacing of parents signing voluntary removal orders in the so-far mistaken belief that they will get their children back on the way out of the U.S. So far, though, the parents have in some cases been deported as the children remain here. That situation is not improving. At the same time, there are also thousands of actually unaccompanied migrant kids—some of whom fled their parents because of abuse. So the institutions that deal with those children—shelters, foster care, lawyers, etc.—need to remain in place and supported. It’s imperative that these separations not be allowed to turn kids with loving parents into effective orphans. Parents ought not to be deemed unfit because they made a dangerous journey, or for border crossing, or because they will not have ample resources in the near term. Worse yet is the frighteningly Kafkaesque possibility that judges who eventually oversee their cases may find that it is not in the child’s best interest to be returned to parents who have been sent back to their native countries. Why? Because those countries are dangerous, which is precisely why their parents fled in the first instance.